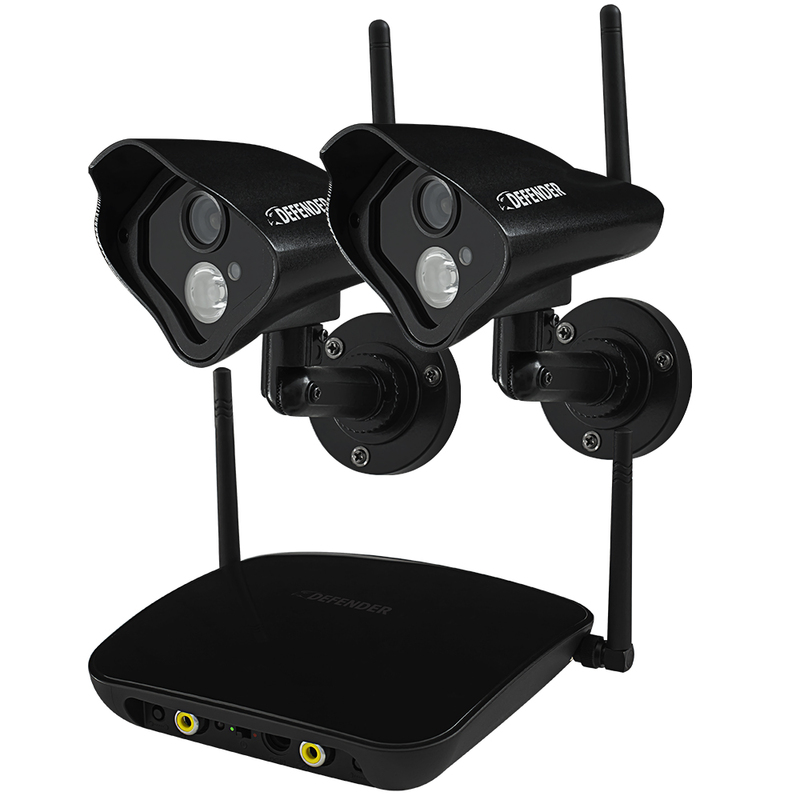 Defender® Pro Wireless Security System can be used to monitor video in any indoor or outdoor space at any time of the day. The wireless, weather resistant cameras included with this system have one wide-angled array infrared LED that allows you to see up to 100ft in the dark. Ideal for monitoring what matters most. ClearVu™ digital wireless technology makes set-up hassle free. This advanced system automatically connects when turned on – no wiring required. Superior digital functionality ensures that the signals remain strong as you monitor your business or home wirelessly, up to 750ft away. See it all in pristine detail, day or night: 520 TVL cameras with 100ft night vision leave nothing to the imagination. The indoor/outdoor camera provides you with a clear, secure picture, even when you monitor after-hours in a dark location. The camera comes equipped with advanced night vision and a wide-angle array infrared (IR) LED that let you see clearly in the dark, up to 100ft away! The array IR LED provides clear and even night vision that is able to cover the camera’s entire field of vision. The LED activates automatically when it gets dark. Night vision range up to 100ft under ideal conditions. Objects at or beyond this range may be partially or completely obscured, depending on the camera application. ©2014 DEFENDER®. All rights reserved. DEFENDER®, the DEFENDER® logo and other DEFENDER® marks may be registered. All other Trademarks are the property of their respective owners.. I bought this system Jan/2016. So far I love the product and the ease of operation. The manual does not do a good job of explaining how to set up some of the features. However Chatting on line with Very knowledgeable real people have resolved all my issues very quickly and professionally. The only issue I have is the wireless signals slowdown my wireless router signals, because they are in the same room. I have 3 cameras inside and 1 outside and they work great in all weather and at night. We actually purchased model 21317, with only 2 cameras, but otherwise the same. Could no longer find model 21317 on site. It was pretty easy to get connected and paired easily. Great picture quality and has large viewing area. Seems like a very good system. Easy to install and set up. Picture clarity is great and the night vision is excellent! Would definitely recommend. I would highly recommend this product to a friend or family member. We looked at many cameras before we decided to purchase this DVR camera system. Very easy to setup, it has great picture quality at an excellent price. Had to call tech support for assistance on how to set up the network, Michel the tech who assisted me was great, very patient and knowledgeable. He helped me set up my DVR for viewing on my laptop and with my smart phone. Easy to use, good picture quality - day and night. Other than some difficulty getting the receiver to match to the cameras, the system was very easy to set up. I have no issues with WiFi interference even though I have the receivers right next to my wireless computer antenna. Be careful to not plug the 12 v. DVR power plug into the 6 v. receiver. They are interchangeable.